We’re excited to expand our offerings. Presentation expert Michele Trent has joined our team and is offering two new coaching packages to help you master the basics and polish your public speaking skills. Having worked with big and small businesses, and for-profits and non-profits, Michele brings a wealth of experience. You can learn more about Michele’s extensive communication, marketing and entrepreneurial background on our About page, and you can learn more about our 1-on-1 offerings on our Personal Coaching page. We are excited to grow our business and help more business professionals become the speakers they’ve always wanted to be in the year ahead! 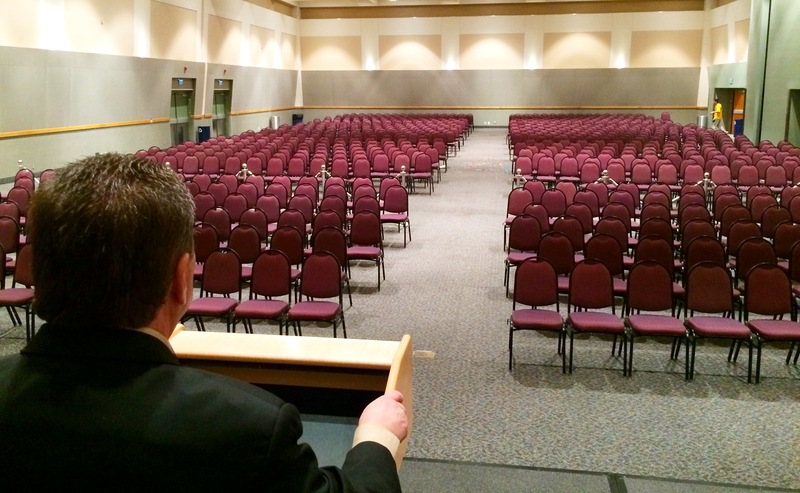 It’s a good public speaking practice to inspect speaking venues before you deliver your presentation. Where will you stand? Where will your audience be? What AV equipment is available? Where will your laptop go? Do you have the right connections for your laptop? Will you need a microphone? Checking out the room layout and the AV equipment is important for practical reasons. But there are also psychological reasons to do a site inspection. I like to do my inspections several days in advance so that I can visualize the location and become comfortable with it in my mind. If you cannot do an inspection days in advance, come to your presentation an hour or so early. That way, you have some time to become comfortable with the room and the available equipment. If something needs to be fixed, moved or changed, you have some time to do that. Doing a site inspection is a great way to avoid pitfalls and also a good way to see if your site offers any opportunities. 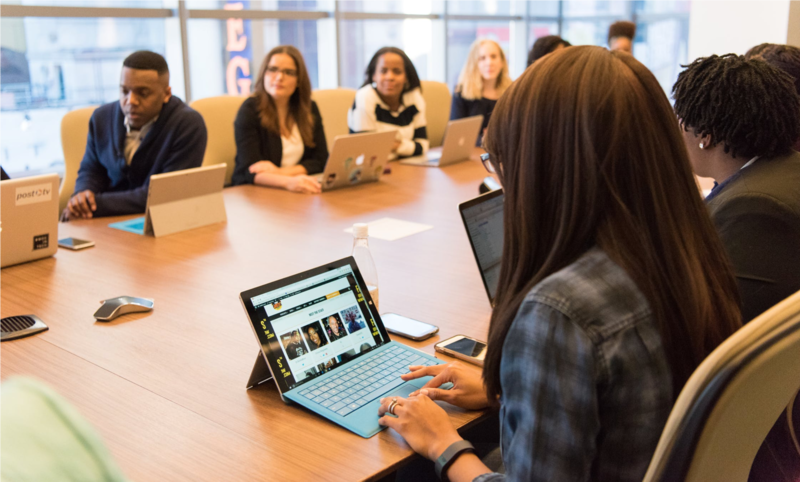 Even if you are presenting in your own office building, make sure you are familiar with the room where you will be presenting and make sure you are comfortable operating all the technology. Fumbling around trying to find out how to adjust the lights or get the sound to play on your video can ruin an otherwise great presentation. When you take time to do a site inspection, you will be that much closer to having a great presentation. Make it part of your routine and you will present like a polished pro. 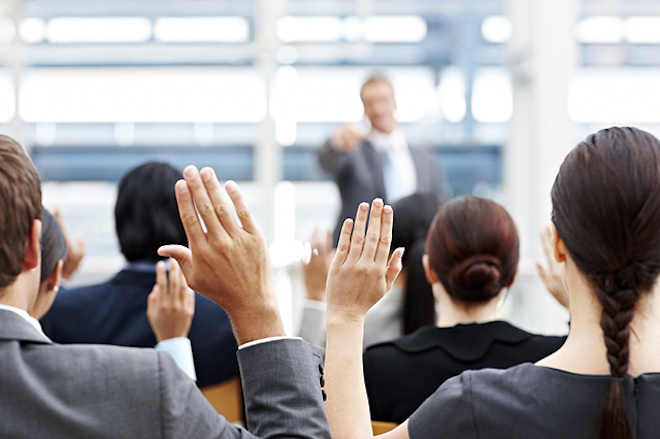 Asking your audience a “by show of hands” question just might be the most engaging type of question you can ask and one of the most powerful tools you have available as a public speaker or business presenter. First, like all questions, the audience has to think about their answer (provided you word it correctly and pause to give audience members adequate time to think). Second, the audience has to involve themselves physically (granted it’s not calisthenics, but there is some physical motion involved). Third, it engages audience members with one another as they look around to see who has their hands up and who doesn’t. Ask a question like “by show o hands, how many parents do we have?” and you’ll see audience members form instant bonds with one another. First, make sure the question is worded clearly so audience members are crystal clear about how to respond. If you’re going to ask the question, take the time to get the answer. You and your audience will be glad you did. It was the day before a big workshop that I was presenting and the unspeakable was happening – my throat was getting sore and my voice completely gave out a few times. Would I awaken the next morning with full blown laryngitis? Would I be able to speak for three hours or would I have to cancel? What could I do? As is my custom, I had a backup plan for everything – everything that is except for my voice being reduced to a mere whisper. However, I had a secret weapon – my wife, Maribel, and one of her home remedy Filipino concoctions called Salabat tea. The taste of Salabat is not exactly my cup of tea, but the effect was just what the doctor ordered. I sipped on the tea throughout the night and rested my voice as much as I could. With each swallow, the brew produced a slight burning sensation in my throat and that made me feel like something good was happening. The next morning, I was able to speak with confidence and finish the three-hour workshop with all of my vocal cords playing in harmony. And so, I offer the recipe for this enchanted elixir to public speakers and business presenters everywhere. Here’s how to make Salabat: Pour 4 cups of water in a covered saucepan and bring to a boil. 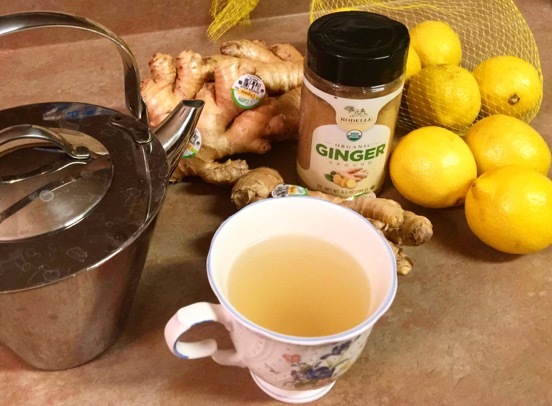 Peel and cut a 6-inch or so ginger root into thin slices and put them into the boiling water. Add ¼ cup of raw honey. Squeeze a fresh lemon into it. Lower the heat and simmer for about 20 minutes. Strain the ginger root slices out and serve hot. Sip away. If your tea begins to cool, zap it in the microwave. Keep it hot but drinkable. So, there you have it. May you be well and may you speak well. Cheers! We’ll be saying goodbye to 2018 and hello to 2019 before you know it. If you have a fear of public speaking, 2019 can be the year you put that fear in your rearview mirror. If public speaking is holding you back in any way, why not make improving your presentation skills your New Year’s Resolution? It can certainly help make your 2019 more prosperous. We’re teaming up with the Phoenix Business Journal to help you get 2019 started off right. We’ll be offering a workshop at the Better Business Bureau from 11:30 a.m. to 2 p.m. on Wednesday, Jan. 23. Exclusive Discount: Use promo code PAUL to get a 20% discount off. Our workshops with the Business Journal always sell out so make your reservation now. This is the perfect chance to make head into 2019 with the confidence to speak up and the skills to stand out! Most business public speaking isn’t done from a podium on a stage. Most business presentations are done in conference rooms, in boardrooms, by speakerphone, or Go to Meeting webinars. Some presentations are done by teams or in panels. Are there business presentation tips you’d like to read? Let us know what they are and we’ll post them. I had a great time presenting my “3 Steps to Own ANY Room” workshop yesterday. 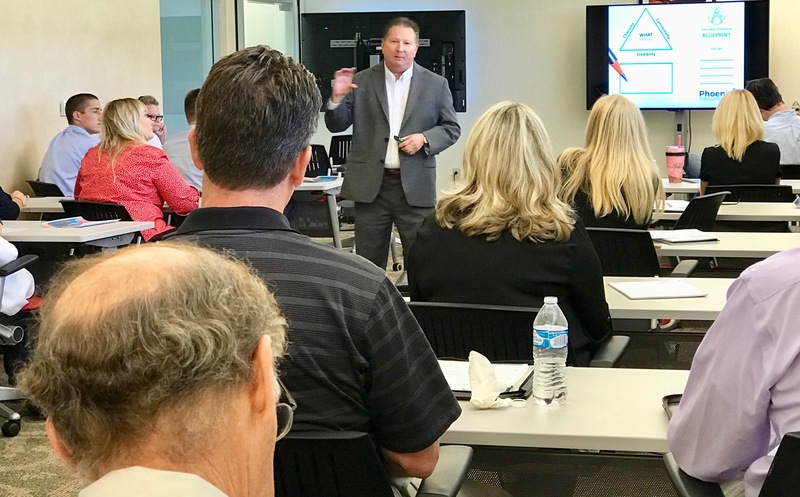 Many thanks to the Phoenix Business Journal for sponsoring the workshop and the Better Business Bureau for hosting it. This one sold out, so I’ve added a new workshop to be held Saturday, Oct. 20, at the Phoenix Central Library, from 10 a.m. to noon. The workshop is free to current and past coaching clients. General admission is $30. Seating is limited to the first 12 signups. Have you ever had to make a business presentation for remote colleagues over speakerphone? Despite all the whiz-bang technologies available, it’s still common to hold business meetings via speakerphone and doing so present challenges for a presenter. Audiences cannot see your facial expressions or gestures, and they may not have a high-quality speaker system to hear you. Test the sound quality on your end before you start. Are you close enough to the speakerphone? Are there any distracting noises on your end that can be eliminated? Encourage speakers who are not speaking to put their phones on mute. If you typically speak fast, speak slower than you would before an in-person audience. Use simple words. Make complex ideas simple. Consider sending handouts before the meeting so that participants can follow along. You may want to include a good picture of yourself with these handouts so that participants can put a face with your voice. Be careful with dry humor and sarcasm. This type of humor could be easily misconstrued without visual cues. Be careful with open-ended questions. It’s easy for people to talk over each other. Consider calling on each person by name for comments and questions. Be careful with interjections. In person, it’s nice to interject with “uh-hum” or “I see” to let the speaker know you’re listening. But, speakerphone microphones typically only let one person talk at a time and these injections can cause the sound to cut in and out. Instead, listen silently until they are done talking. If you’re using a conference bridge service to host the call, understand how to use all the technology that is available to you. Can you mute non-speaking lines? Can you take polls? Can you record the conversation and make it available later to those who missed the meeting? Following these tips will help your speakerphone presentation be more effective. What tips would you add? Please share in the comments section below. We’d love to hear from you. From my experience speaking in front of hundreds of audiences, I have learned that stories are memorable because of the images and emotions contained in the story. The lesson of the story sticks because it’s embedded in an image. The image isn’t a still picture; it’s a motion picture, a movie. Let’s test my theory. Take a moment now to think about a movie that you first saw over 10 years ago, prior to the year 2000. Have you identified your movie? Now, what do you remember when you recall this movie? I bet that the first thing that came to your mind was an image or a scene. You remember the actors, their clothes, the location, the situation, and the emotions. You can see these images as easily now as you did when you were watching the movie. What you remember next is dialogue. But compared to how vividly you remember the images, you probably don’t remember much of the dialogue. Your brain remembers pictures first. It then remembers the emotional context, and finally, it remembers language. “Look for the Limo” is the branded point of the story. I call it a Phrase That Pays. Because they remember the story, they remember the point. When they remember the point, it becomes actionable. Most people who have ever given a speech, run a business meeting or tried to sell a product or service will tell you that stories are more memorable than facts and data. In my experience, the story is essential if you want people to remember any of your content. At last I’ve found a scientific explanation to explain what I’ve been teaching for the last 20 years – mirror neurons. We don’t just listen to stories; we see images and feel emotions. We actually experience the story as if it’s happening to us. In other words, when you tell a story and make a point, you make an emotional connection. When you make an emotional connection, you and your story are memorable. Doug Stevenson, CSP, works with salespeople, leaders, professional speakers, trainers and fundraisers to help them make a point, teach a lesson or sell a product or service. He has delivered storytelling keynotes and training in 17 countries and has coached over 800 individuals who want to take their storytelling skills to the next level. Doug is the author of “Doug Stevenson’s Story Theater Method,” and the “How to Write and Deliver a Dynamite Speech System.” Some of his clients include Microsoft, Oracle, Google, Cisco, SAP, Amgen, Bristol Myers-Squibb, Genentech, Aetna, USAA, Lockheed Martin, Coca Cola, Caterpillar, The American Medical Association and hundreds more. 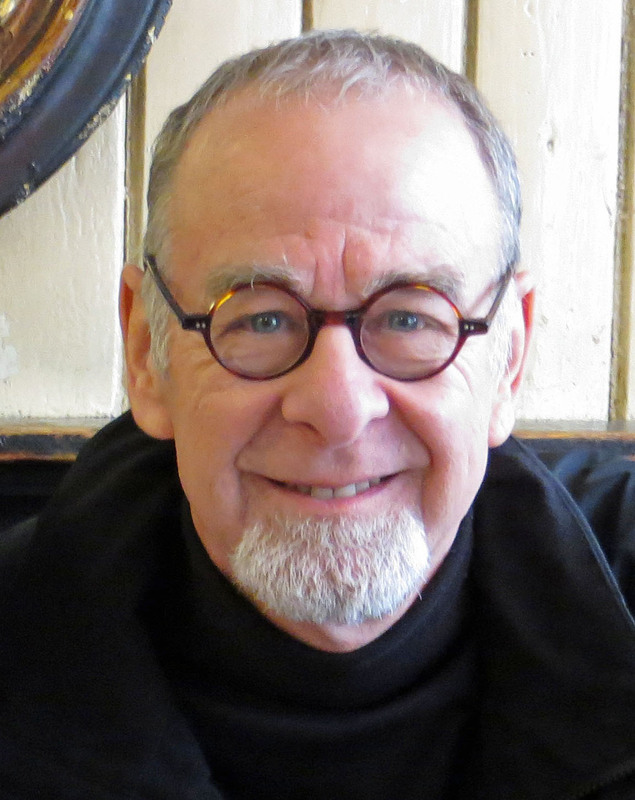 Connect with Doug on his Storytelling in Business website. 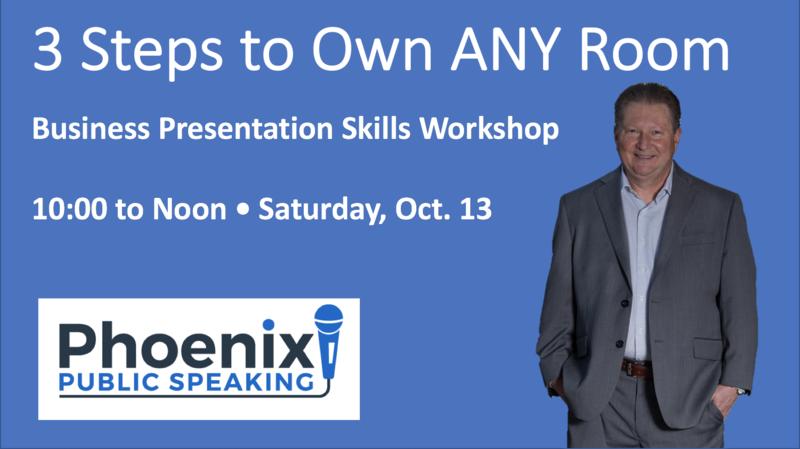 Our “3 Steps to Own Any Room” public speaking skills workshop sponsored by the Phoenix Business Journal is sold out so we’ve added a new one. The new workshop will be held Saturday, Oct. 20, at the Phoenix Central Library, from 10 a.m. to noon. Sign up to keep informed on our upcoming events and promotions. 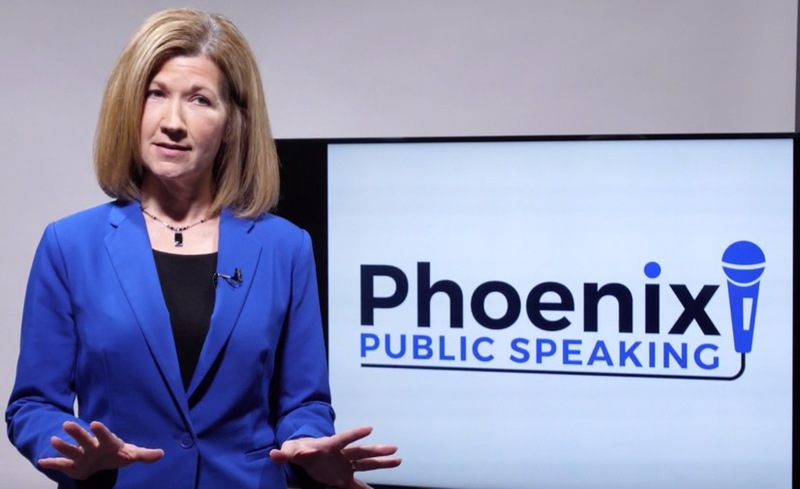 Copyright © All rights reserved – Phoenix Public Speaking.